In Buffalo and Western New York, Dr. Shatkin is the only center to offer the PicoSure Focus Array laser which offers rejuvenation with NONE or MINIMAL DOWNTIME! 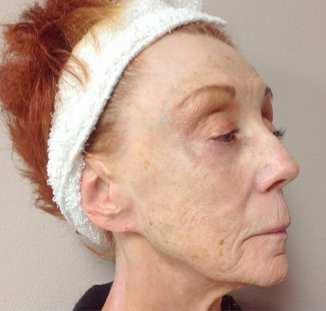 Actual Patient of the Aesthetic Associates Centre- Note the improvement in the overall appearance, reduction of dyschromia (discoloration), texture, wrinkle reduction and refreshed appearance. Tremendous innovation from Palomar Medical with the Lux 1540 Fractional Laser Resurfacing, with fabulous advantages over other fractionated laser resurfacing. LUX 1540 is great for lines, wrinkles, acne scars, pigmentation disorders, sun damage, etc. Super results on face, neck, (V) of chest, backs of hands, etc. The Lux 1540 Fractional, the newest fractional laser does not require the patient to sit or lay for sometimes an hour or more ahead of time with a messy blue dye on the skin, and then this blue dye has to be removed after their face has been irritated by a laser procedure. Lux 1540 Fractional laser can be done with or without anesthetic, but we generally use a topical anesthetic for about 30 minutes before the procedure and thus the whole procedure can be made very comfortable and done in about thirty minutes. Most fractionated laser operators often require or suggest up to four or five treatment sessions but the STARLUX 1540 Fractional laser usually requires around three sessions in most circumstances. Excellent results have been obtained for acne scars, pigmentation disorders like melasma, sun and aging damaged skin, line and wrinkle resurfacing, along with improvement in stretch marks and striae from the reporting of clinical researchers. Palomar developed and patented Fractional Photothermolysis first, ahead of other companies, to create a revolutionary treatment: in non-ablative soft tissue coagulation and skin resurfacing with high efficacy and no downtime. The Palomar Lux1540 Fractional Laser Handpiece, FDA cleared for soft tissue coagulation, delivers light in an array of high precision microbeams. These microbeams create narrow, deep columns of tissue coagulation that penetrate well below the epidermis and into the dermis, while sparing the tissue surrounding the columns from damage. The coagulated tissue within the columns initiates a natural healing process that accelerates the formation of new, healthy tissue. Excess pigment and coagulated cellular debris are expelled as the skin is resurfaced. Throughout the process, the integrity of the stratum corneum is maintained, which protects the tissue from infection as it heals. 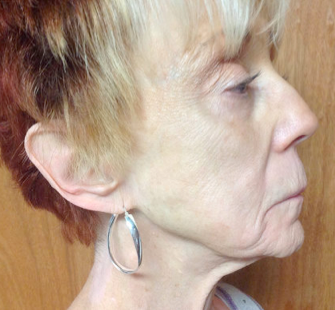 The result: faster dermal remodeling and skin resurfacing. The Palomar Lux 1540 offers greater energy per microbeam (up to 100 mJ), and greater depth of penetration (up to1 mm) than any competing device. This stimulates quick healing within the surrounding deep tissue for the most effective deep corrections and long-term dermal remodeling obtainable. In addition, the Lux1540 delivers uniform microbeam penetration at all times, a consistency that competing systems can’t match. The Palomar Lux 1540 delivers its microbeams in individual short pulses, rather than using a continuous wave that can overheat the skin and cause discomfort.